Guess what? 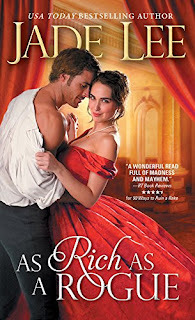 My book As Rich as a Rogue releases today! I’m really excited about this book because it’s funny without losing the complexity of the characters. Plus it’s got a fun parakeet, so what’s not to love about that? You can see more about it below. (Trust me, you won’t regret reading it!) But since this blog comes up on my release day, you get to guess what I’m doing right now. What exactly are Jade Lee’s Release Day Rituals? A. A spa appointment while a hot masseur kneads away my stress. B. Obsessive Social Media stalking. anyone talking about my book? What are they saying? C. Lots of coffee. Duh. It’s a day ending in Y therefore, caffeine. D. Cycling through the following activities: Meditation for calm. Screaming and dancing for joy. Frantic internet exploration for panic. And most important, a rock solid faith that my career is over or maybe about to explode into the stratosphere. Answer: All of the above! Yup. I have no set ritual. Mostly I have coping mechanisms for the ups and downs of this day. So much goes into a book that by the time it comes out, I have years of emotion, imagination, and effort crammed into the words. You’d think after 50+ books, this would be old hat, and it is…kinda. The panic and the desperation are certainly familiar, as is the exhilaration. Mediation came around book 20, and that has certainly helped my family. They meditate regularly to deal with me. Oh wait, yes, I try to go Zen, too. I think my husband gave me the massage gift certificate just to get me out of the house. Speaking of which…I need to go make the appointment. I wonder if there’s a Ryan Reynold’s look alike at the spa (pre-becoming Deadpool). Want a chance to win your own autographed copy of As Rich as a Rogue? Just comment below and tell me why you love historical romance! Don't miss your chance! Contest ends August 9, 2016 at 5 p.m.
Historicals are my favorite - learning about the past in a very pleasurable way! You are the winner of this contest! Congrats! Please email my assistant at barbara.jade.kathy@gmail.com to organize your prize. May the Best Man Win by Mira Lyn Kelly - out now!